A cause and effect essay is one of the more basic types of works that students are required to undertake. Writing cause and effect essays begins in grade school because it's important for students to develop a solid understanding of the "cause and effect" concept early on in their academic careers. As students begin to understand simple cause and effect, they can be encouraged to think critically about many things. By the time the student reaches college, he/she should be prepared to understand cause and effect relationships in many areas. Writing a cause and effect essay is a common assignment for students at any stage in their academic careers. The idea is to ultimately encourage students to explore cause and effect relationships which might be multi-faceted rather than one-dimensional. The cause and effect essay is rarely a one-size-fits-all production since different students might view cause and effect relationships in varying ways. When completing a cause and effect essay, learners should ensure that they have presented a well-documented argument within a well-structured paper. To do this, a student has to make sure that he/she has completed a cause and effect paper that contains information pertinent to the topic, follows the format required by the instructor, and that includes solid research using credible references. A cause and effect report should begin with an introduction to the topic. 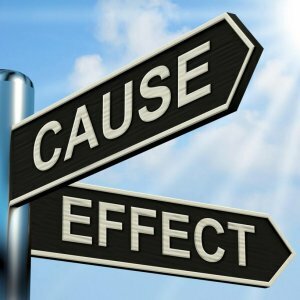 In most cause and effect essays, the topic is simply either the cause or the effect. In general, a student will be given instructions from the professor to approach the writing of the cause and effect essay from either the cause or the effect. When students are younger, they're required to deduce effects from causes. As students develop higher thinking skills, they might be asked to think about what causes certain effects. In essence, they might be required to work backwards. Occasionally, a cause and effect essay assignment might allow the student to select which way he/she wants to present the exploration. In addition to the introduction, it should contain a body and a conclusion. A student can gauge how much space to dedicate to each segment of the report by multiplying the number of pages required by the standard one-three-one rule of report composition. For instance, a one-page report should have a one-paragraph introduction, three body paragraphs, and a one-paragraph conclusion. A two-page report should have two introduction paragraphs, six body paragraphs, and two conclusion paragraphs. Students must also be certain to follow the citation guidelines given to them by the course instructor. A well-written report must also be grammatically correct and free of spelling and punctuation errors. It is important for students to pay attention to not only the content of their document, but to the mechanics of paper-writing, as well. The methods you that use for completing a cause and effect essay will somewhat depend upon the length and the precise assignment that you have been given. If, for example, you must complete a 1,000-word essay, you would actually focus more on just the cause or the effect of a certain subject. In addition, you might focus on just one cause or on just one effect. If, on the other hand, you're completing a twenty-page essay, you might explore the causes and effects extensively. Since the layout of cause and effect essays can be so varied, you'll need to consider the length when deciding how to go about writing the document. If you're to write about air pollution, for example, you could probably come up with a dozen causes for air pollution as well as a dozen negative effects. If you were completing an extensive essay, you would discuss all of these issues. Otherwise, you might just select one. For example, you might write a document that simply states that one of the causes of air pollution is car exhaust and then your entire paper would be about how car exhaust affects the air. Regardless of the topic and how broad your work will be, you should have all of the causes and all of the effects clear in your mind. Even though you won't be discussing them all in your document, you should list all of the causes and effects you can think of in order to help you organize your thoughts and narrow down the topic you'll write about. Once you have settled on the causes and/or effects you'll be writing on, you need to develop a thesis statement and then research the supporting details. For example, if your thesis is "One of the biggest consequences of air pollution is its effects on the health of people," you'll need to research information that supports how air pollution is harmful to human health. Each of your subsequent paragraphs should include a topic sentence supporting the negative health effects of air pollution. For example, your second paragraph may state, "Research shows that air pollution has a negative impact on human lungs." Then, the remainder of the paragraph should describe the effects of air pollution on lungs. The next paragraphs should then describe a different negative health effect and then provide further detail. After providing supporting information and including at least three paragraphs to support your thesis statement, you'll need to complete a conclusion. Your summary shouldn't include an opinion, as a cause and effect essay isn't about expressing opinions. Rather, it should simply summarize the information. Similarly, a cause and effect report shouldn't present ideas for solving the problem and shouldn't include a "call to action" that encourages the reader to make a change. Rather, the information should simply be presented in a factual manner so the reader can draw his/her own conclusions. The cause in terms of why people -- especially those involved in athletic competition -- would take a drug as dangerous as anabolic steroids is easy to understand: athletes want an edge, they want to have a body that is more powerful and can propel them to victory, winning, and personal pride. The effects of anabolic steroids in the short-term can seem positive for the user; however, in the long run the effects of anabolic steroids are highly negative, and this paper brings to light the reasons why steroids are dangerous and can lead to serious physical and mental problems for the individual.